Elzoneta 10 Port is an unmanaged poe network switch with 96 watts of PoE power. All PoE ports run at 10/100Mbps and can provide up to 15.4W per port through the IEEE 802.3af standard. 【PoE+ Ports】8*PoE+ Ports at 10/100Mbps RJ45 port each, this technology allows the poe switch gigabit to send power as well as data to connected devices, simplifying installation and reducing electrical wiring costs. With PoE+ your business can deploy network systems such as wireless access, IP telephony, or video surveillance solutions without having to worry about outlet placements or installing separate power supplies for individual devices. 【NETWORK PROTOCOL】IEEE 802.3i 10BASE-T, IEEE 802.3u 100BASE-TX, IEEE 802.3x Flow Control, IEEE 802.3af Power over Ethernet. 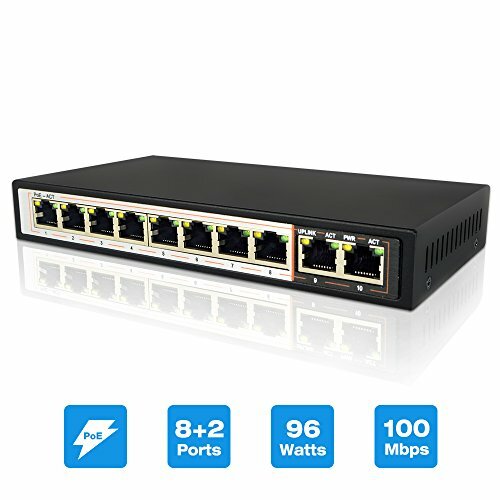 With mutilple network protocol, this 10 port switch can connect most of devices in the market, to satisfied your needs. 【PLUG AND PLAY】More convenience, setting up your unmanaged switch poe is as easy as plugging it in and connecting your network devices with Ethernet cables. The auto-sensing ports optimize speed for each connected device, so you don't have to configure settings to get optimal performance. 【SAFETY POWER SUPPLY】With power supply circuit protection function to protect back-end device safety; Intelligentize power and minimum consumption, guarantee PD requirement; Single fan radiating increase the device performance. We offer 30-day money-back guarantee, 1 year quality warranty, worry-free shopping. If you have any questions about this product by Elzoneta, contact us by completing and submitting the form below. If you are looking for a specif part number, please include it with your message.